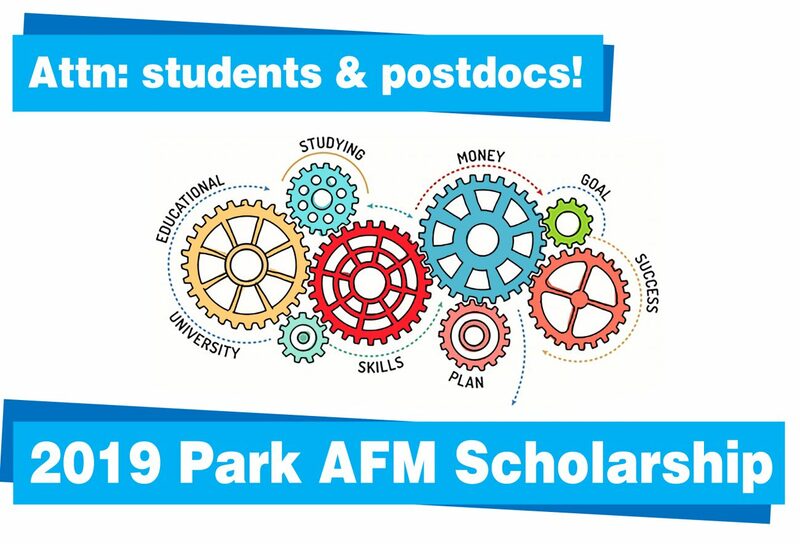 Park Systems, the world’s leading manufacturer of atomic force microscopes (AFM) invites all researchers worldwide to apply to become Park AFM Scholars and receive a research scholarship. Park AFM Scholarship Awards are open to undergraduate or postdoctoral students working in nanotechnology research either already using Park AFM or who have research they would like to do with a Park AFM and need help getting access to equipment. 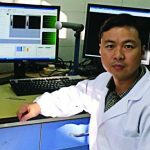 Through this program, Park Systems has offered assistance to many researchers who qualify as Park AFM Scholars by matching them with one of thousands of nanoscience shared user facilities to perform their research using Park AFMs. 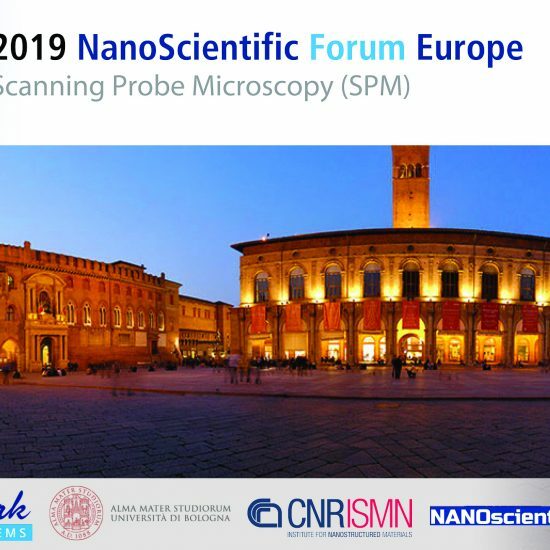 The Park AFM Scholarship Award is open to postdoctoral researchers and graduate students working in nanotechnology research using Park AFM. As progress for nanotechnology research and development advances at an unprecedented rate, universities worldwide offer degrees in fields working with nanotechnology. Park Systems, world-leading manufacturer of atomic force microscopes, is offering a $500 USD monetary scholarship to promote the education of future scientists and engineers in a number of nanoscience research areas that require advanced nanoscale microscopy for sample analysis and observation and to promote shared research findings and methodologies amongst their peers. 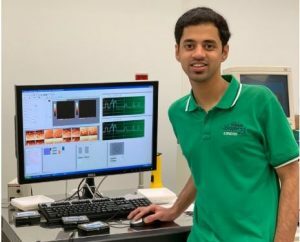 Park Systems will offer assistance to researchers who need a facility to perform their research using Park Atomic Force Microscope by matching them with one of their shared nano facilities. Advanced device manufacturing requires stringent process conditions to prevent defects that can lead to device failure and reliability issues. In particular, defects such as residual particles, foreign materials, scratches, etc. 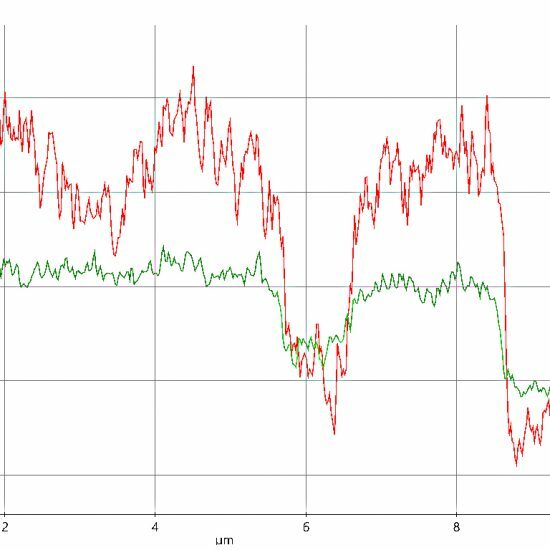 should be removed from the wafer surface after chemical mechanical planarization (CMP). 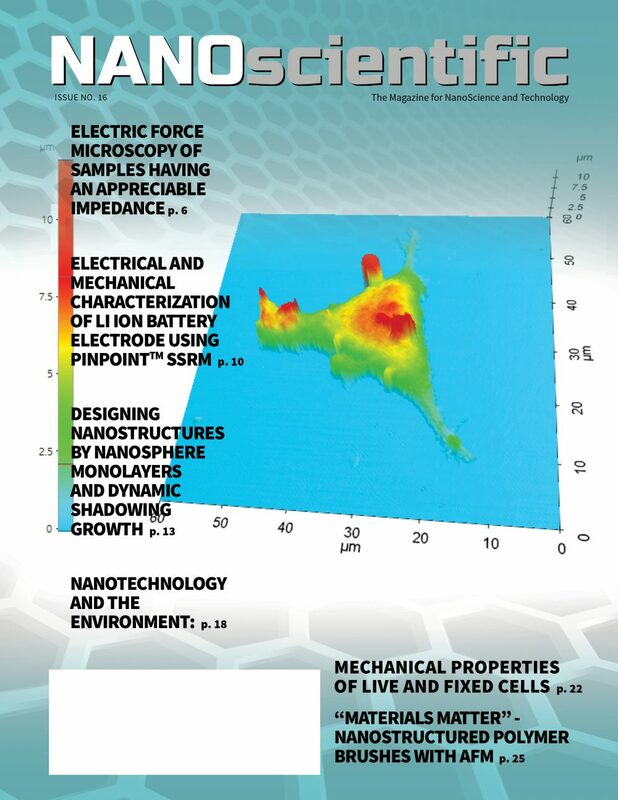 How do you use AFM in your research? Chemical mechanical planarization (CMP) is one of the most crucial steps in the manufacturing of integrated circuits (ICs). In a typical CMP process, a wafer is pressed against the polishing pad fixed to a rotating platen and the chemical slurry (consisting of abrasive particles and necessary chemical additives) is supplied on to the pad. The wafer is polished by the combination of chemical and mechanical forces. CMP inevitably introduces surface defects and contaminants due to the presence of chemical additives and abrasive particles in the slurry used to planarize wafer surfaces. Surface particles are one of the major defects induced by CMP. If not removed, they can cause short or open circuits and affect the final device performance and reliability. Therefore, cleaning such particlulate defects on wafer surfaces post-CMP is critical for successful manufacturing of ICs to improve productivity. 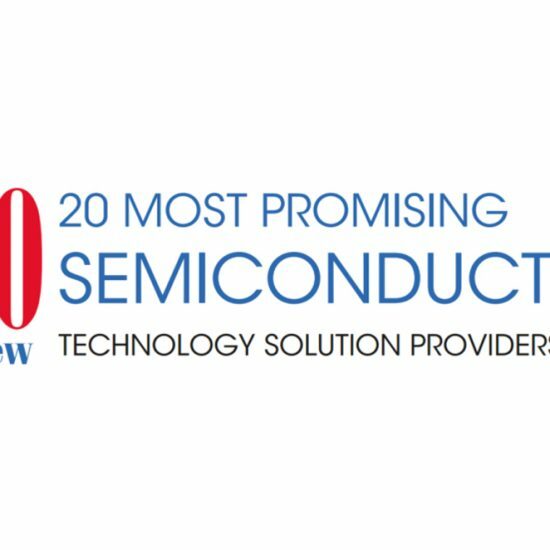 Billion or so active transistors in each IC is electrically isolated using shallow trench isolation (STI) CMP. Ceria particle-based slurries are used to polish STI structures. 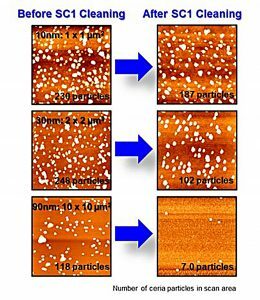 Due to high chemical affinity of ceria particles to silicon dioxide surfaces, STI CMP leads to particle contamination making post-CMP cleaning challenging as ceria particles adhere very strongly to STI wafers during polishing. In our research, we are developing cleaning chemistries than can remove ceria particles from silicon dioxide wafers. The particles on silicon dioxide wafer surfaces before and after cleaning are imaged using atomic force microscopy (AFM) and counted. Subsequently, cleaning efficiency is calculated to evaluate the effectiveness of the developed cleaning chemistry. Figure 1. AFM image of silicon dioxide wafer surface (a) contaminated with ~30 nm (mean diameter) ceria particles and (b) cleaned with a cleaning solution In this case, the number of particles before and after cleaning is 290 and 12 respectively and the corresponding cleaning efficiency is 96%. Figure 2 (Above): Topographic images of adsorbed ceria particles on silicon dioxide wafer surfaces in scan areas of 1 × 1 µm2 (for ~10 nm ceria particles), 2 × 2 µm2 (for ~30 nm ceria particles) and 10 × 10 µm2 (for ~90 nm ceria particles). 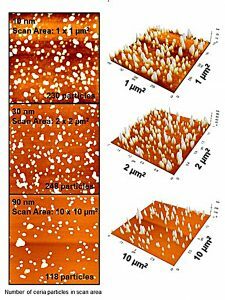 Different scan areas were chosen for different sized particles to obtain adequate number of particles in AFM images. Figure 3 (Above): AFM images of adsorbed ceria particles on silicon dioxide wafer surfaces and the corresponding number of particles before and after cleaning with standard clean 1 (SC1) solution in scan areas of 1 × 1 µm2 (10 nm-ceria), 2 × 2 µm2 (30 nm-ceria), and 10 × 10 µm2 (90 nm-ceria).